I LOVE using fresh herbs in my meals. Even better, though, is when the fresh herbs come from our garden. Today's meal, Pumpkin Sausage Pasta, has fresh Sage. Mmmmmm, the fragrance is heavenly! This year we are also growing rosemary (well, that's a year round bush), basil, thyme, oregano and some type of lemon scented oregano. What herbs are you growing in your garden this year? 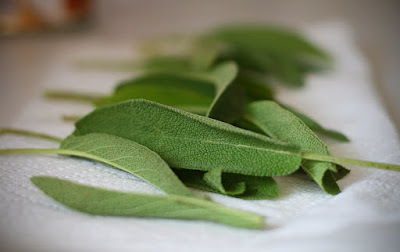 What are your favorite fresh herbs to cook with (even if you don't have a garden)? I didn't pick up any herbs to grow this year, but I have echinacea and lavender that are growing in my flower garden! Oh, I forgot about lavender!!! I have three lavender plants (or are they bushes??) in the front of the house. LOVE the smell! Oh, and I recently found a recipe for Honey Lavender Ice Cream! Can't wait to try it!! I'm trying to grow basil and Italian parsley. I haven't really cooked with fresh herbs or tried to grow any before. Do you have any recipes for using basil that you like? I have some that uses tomatoes and basil, but tomatoes won't be ready up here until the end of summer...I could buy at the grocery store, but I would like to try the home-grown ones first. You will LOVE fresh basil and BOY does it seem to grow easily around here! Hopefully that'll be the case for you, too!!! I have a few recipes on my site that use fresh basil. Click here. And please share whatever it is you decide to make! I LOVE trying new recipes!! I'm growing parsley, cilantro, stevia, lemon balm, mint, lavender, shallots, garlic and basil. I also have rhubarb in my herb garden (for lack of a better place to put it). Parsley and garlic are my faves. Is there a secret to growing garlic? I've tried two times and NEVER been successful!! PLEASE, will you share all of your tips? Cilantro, oregano, mint, chives, basil, lemon balm, garlic---I thought the garlic wasn't growing and started to dig them up and lo and behold there they were. The ground smelled heavenly too--a deep garlic smell--my first year attempting them. I am also growing nasturtium--edible flowers for a salad. I have all kinds of herbs growing right now and i am loving it! Isn't it great?!? Wow! Your dish sounds delicious. Thank you for sharing the recipe. Hi, I'm back here after taking a vacation back home to the South - North Carolina and Virginia. I've been reading over your posts and boy I miss having a veggie garden ..the fresh herbs are so wonderful to cook with, aren't they. Sooo aromatic. When you have time, stop by and see my uploaded photos of our first day on the trip...Mt. Vernon. The gardens are to die for. That recipe looks really good-- who would think of putting pumpkin in a pasta dish, might have to try it!